Baking and Mistaking: Happy Birthday...quick! Anyway if you thought for a minute I was going to say I saved time by using a cake mix you are very much mistaken. Never! Well, never say never. Fingers Crossed? Anyway I cooled this cake quickly by putting it in the fridge for a little (it's our little secret, right?). Keep in mind this was about at 8pm and we were taking the cake over to her house at midnight. Anyway I frosted this with storebought chocolate frosting, mmmmmm, and then as you can see decorated with store bought candy letters. Man, those things are like pure sugar. Mmmmm. In the picture it looks like the H in happy is out of line but I promise it didn't look like that in real life. Also, the packet of letters came with only one I, which clearly didn't work for my purposes, but luckily also came with two number 1s. Victory! 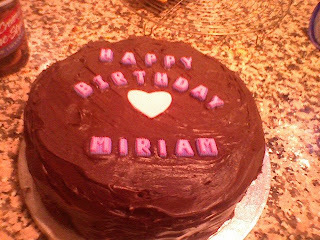 Additionally, if you look, the cake is adorned with a festive fondant heart. Because who doesn't love fondant. Anyway I should probably be a little embarassed to share with you my speedy cake making tips, but I'll hold my head high anyway. Plus, Miriam appreciates resourcefulness. Who doesn't? Tip of the Day: When decorating a cake with words or letters always start from the middle and go outwards to make sure everything is properly centered on the cake.